Excavation and foundation preparation are currently underway at the project site for the 98,900-sq-ft Capitol Courts multifamily building, located at 1220 Pennsylvania Avenue in Washington, DC. 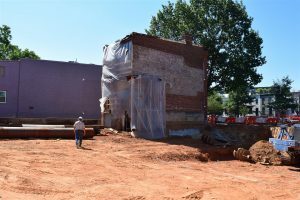 Kinsley recently completed the demolition of the back half of a 100-year-old townhome on the property. The remaining portion will be used as the rental office for the 117-unit apartment complex. The existing town home will be utilized as a rental office. Located ten blocks southeast of the Capitol building in the revitalized Hill East neighborhood, the Metro transit line runs parallel to the property. The subway’s close proximity to the project increases the importance of temporary stabilization of soil during excavation. Crews are stabilizing the soil and neighboring buildings by sheeting and shoring with soldier piles and timber lagging. Nearly 75 holes, ranging from 15 to 30 feet deep are being drilled for the pile I-beams. 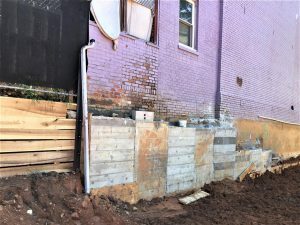 To complete the shoring process, once a row of beams is grouted into place, wooden planks are inserted between them to form a wall around the site’s perimeter. This wall supports the soil and structures. Shoring up the neighboring buildings. Drilling activities have been met with daily challenges. 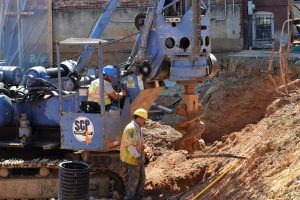 Workers are encountering rock, clay deposits and water that all require timely drill bit and equipment changes. At Kinsley, not meeting the project’s completion date is not an option. By creating three-week look ahead schedules that are closely tied to the critical path milestones, we can anticipate potential impacts to the schedule. Despite the drilling challenges, the project remains on track for a fall 2019 completion.